Science serving sports, industry, and iuman performance. 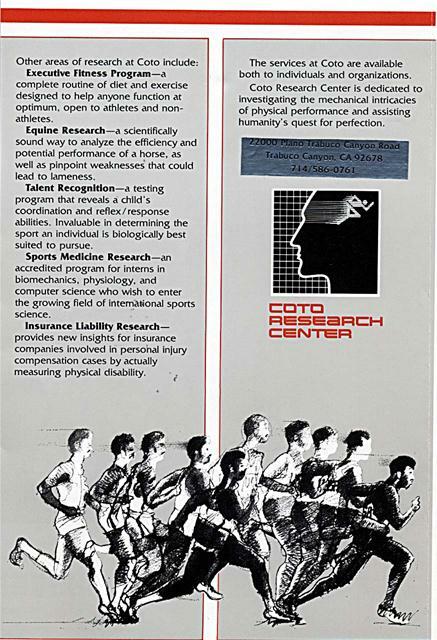 The Coto Research Center applies computer science toward the attainment of optimal physical performance. It was founded by Dr. Gideon Ariel, a former Israeli Olympian and the founder/owner of Computerized Biomechanical Analysis in Amherst, Massachusetts, and Vic Braden, founder of the Vic Braden Tennis College. While research at the center is primarily concerned with sports and analyses of athletic performance and equipment, the research results are being applied in all areas of human, animal, and product development. Clients include the Boston Patriots, Wilson Sporting Goods, Universal Gym Equipment, the Kansas City Royals. Kimberly Clark Corporation, Dow Chemical, AMF, and the United States Olympic Committee. 'hile research at the center is primarily ncerned with sports and analyses of hletic performance and equipment, the search results are being applied in all eas of human, animal, and product !velopment. Clients include the )stop Patriots, Wilson Sporting Dods, Universal Gym Equipment, the insas City Royals, Kimberly Clark )rporation, Dow Chemical, AMF, and e United States Olympic Committee. Recently completed, the Center is located in the Coto de Caza resort community near Irvine, California. The 7,776 square foot complex houses a comprehensive computer system, laboratories, exercise/workout areas, offices, and conference/ projection rooms. A 13,300 square foot outside testing/tournament arena (with a projected seating capacity of 5.000) features a regulation size cement surface tennis court and a 200 meter two-lane rubberized track. The Coto Research Center is unquestionably the finest facility of its kind in the world. 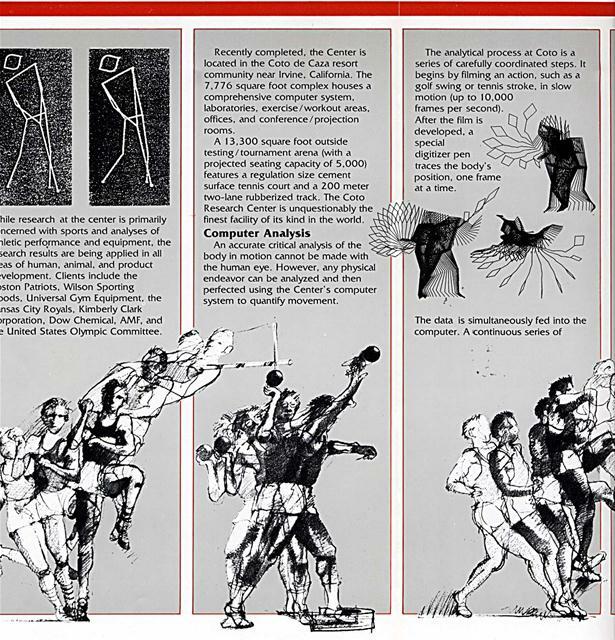 An accurate critical analysis of the body in motion cannot be made with the human eye. 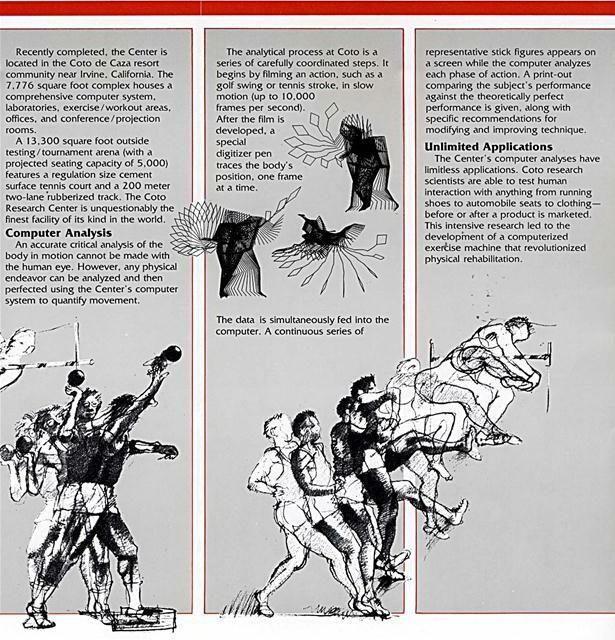 However, any physical endeavor can be analyzed and then perfected using the Center's computer system to quantify movement. developed, a special digitizer pen traces the body's position, one frame at a time. Recently completed. the Center is located in the Coto de Caza resort community near Irvine, California. The 7,776 square foot complex houses a comprehensive computer system, laboratories, exercise/workout areas, offices, and conference/ projection rooms. A 13,300 square foot outside testing/tournament arena (with a projected seating capacity of 5,000) features a regulation size cement surface tennis court and a 200 meter two-lane rubberized track. The Coto Research Center is unquestionably the finest facility of its kind in the world. traces the body's ~/ position, one frame at a time. representative stick figures appears on a screen while the computer analyzes each phase of action. A print-out comparing the subject's performance against the theoretically perfect performance is given, along with specific recommendations for modifying and improving technique. The Center's computer analyses have limitless applications. Coto research scientists are able to test human interaction with anything from running shoes to automobile seats to clothingbefore or after a product is marketed. 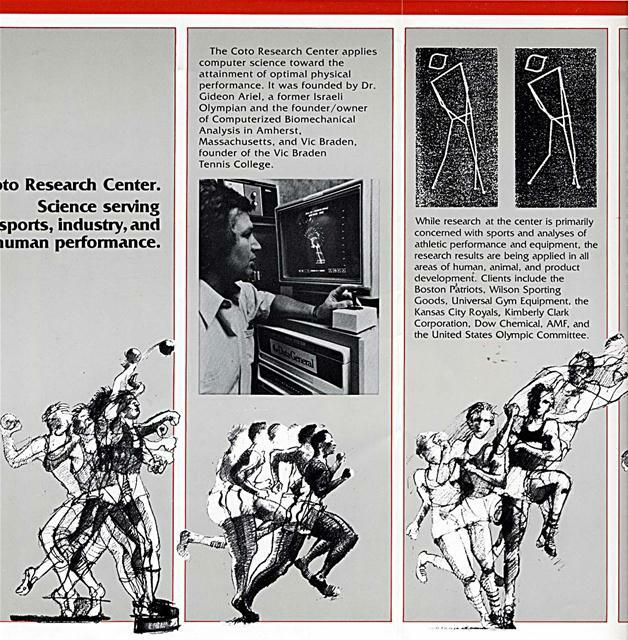 This intensive research led to the development of a computerized exercise machine that revolutionized physical rehabilitation. Executive Fitness Program-a complete routine of diet and exercise designed to help anyone function at optimum, open to athletes and nonathletes. Equine Research-a scientifically sound way to analyze the efficiency and potential performance of a horse, as well as pinpoint weaknesses that could lead to lameness. Talent Recognition-a testing program that reveals a child's coordination and reflex/response abilities. Invaluable in determining the sport an individual is biologically best suited to pursue. Sports Medicine Research-an accredited program for interns in biomechanics, physiology, and computer science who wish to enter the growing field of intemational sports science. Insurance Liability Researchprovides new insights for insurance companies involved in personal injury compensation cases by actually measuring physical disability. both to individuals and organizations. 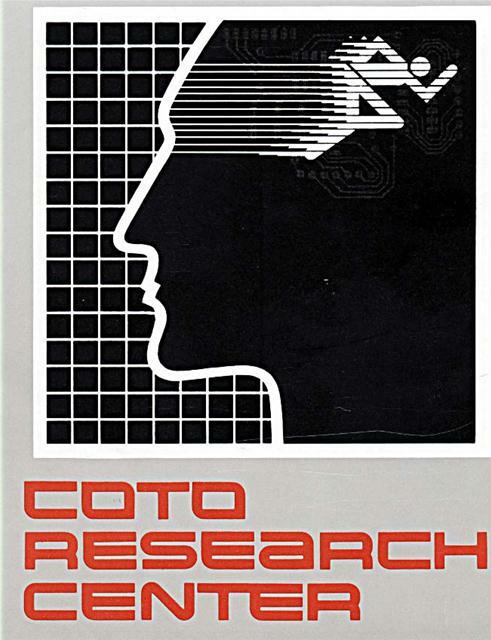 Coto Research Center is dedicated to investigating the mechanical intricacies of physical performance and assisting humanity's quest for perfection. Generated on 4/20/2019 3:40:07 PM (PST) ADI/HQ/GBA/2019/ARIELCLOUD/v3.0.2018.0126.